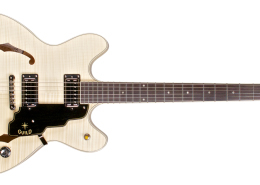 The Starfire IV ST Maple puts a modern twist on a highly popular semi-hollow Guild classic. With its graceful double cutaway and thinline body, the original Starfire IV was prized by many guitarists from the mid-1960s onward for its incomparable tone and feel. Premium features include an all maple body, a solid spruce center block, ebony fingerboard, and Guild’s hallmark mahogany neck with maple center seam. This model features a Tune-O-Matic bridge, with a stopbar tailpiece for increased sustain and stability. The Starfire IV ST Maple includes dual LB-1 “Little Bucker” pickups, replicas of Guild’s original smaller size humbucking pickups. Available in Emerald Green, Natural Flamed Maple or Antique Sunburst, and includes hardshell case.